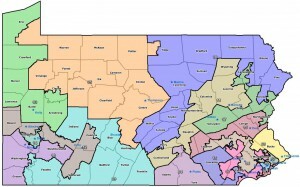 Moe Lane » Analyzing the new Pennsylvania district map. Analyzing the new Pennsylvania district map. 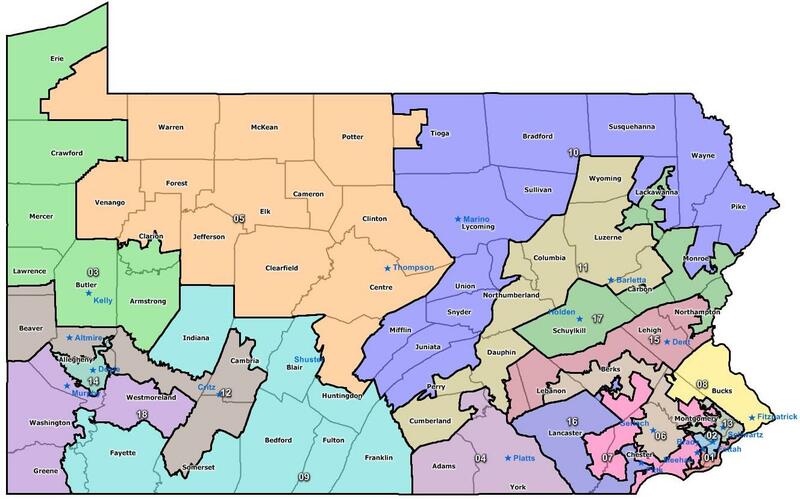 The new redrawn Pennsylvania Congressional map is out, and it’s… well. If you ever wondered whether elections have consequences, then wonder no more. Executive summary: two of the least powerful PA Democratic Congressmen have been thrown into Thunderdome and told to fight each other; the other five PA Democrats have been, ah, reassured that their seats are safe; and the nine PA Republicans have had their seats generally tweaked and shored up to minimize any possibility of losing their seats any time soon. To summarize: currently, there are 12 Republicans and 7 Democrats in PA. Of the 7 Democrats, 2 have been thrown together in one district, which has also been redrawn to make it a more Republican-friendly district; and the other five have been given what appear to be carefully-designed seats that they should have no trouble keeping. The 12 Republicans have likewise been strengthened; prior to this map, there were 5 Republicans in Democratic-leaning seats. Now there is 1. Pennsylvania Democrats are going to try to… dagnabbit, I’m taking this phrase back… they’re going to lipstick the pig and try to claim that this gives them an unparalleled chance to take all of their old seats back and get some new ones, too! BWHAHAHA! HAHA! HA! Ha! Ha. heh. Looking at the basic numbers: I don’t buy it. They shaved off Republican leads carefully in this map and made darn sure that incumbent Democrats (except for Critz & Altmere, neither of whom have been in Congress long) had nothing much to complain about. I don’t normally link to dKos articles, but this one has a decent analysis of the breakdown, district by district: its conclusion of 7 safe Republican, 5 safe Democrat, and 6 swing is a bit optimistic for the Democrats (to me it looks like 8 safe GOP, 5 safe Dem, 2 toss-ups (one each), and 3 swing), but that’s why we have elections. This map is certainly going to make recruitment more difficult for the Democrats this cycle… and that’s not good news for the Democrats when it comes to Obama keeping PA Blue this year, either. And before anybody asks: the general consensus is that there are not going to be any significant Voting Rights Act challenges possible for this map. And – thanks to a Republican legislature and governor – this map is, in the end, probably extremely close to what we’re going to be working with. Written by Moe_Lane in: Politics | Tags: pa-12, pennsylvania, redistricting, revenge is a dish best served cold. And, *kaff* *kaff*, WHO was the representative prior to Critz in PA12? (Hint: if you live in Johnstown it’s easy. Half the place is named for him.) Aaah – the dismantling of a carefully built empire. I’m going to go fix myself a whisky and savor this map.